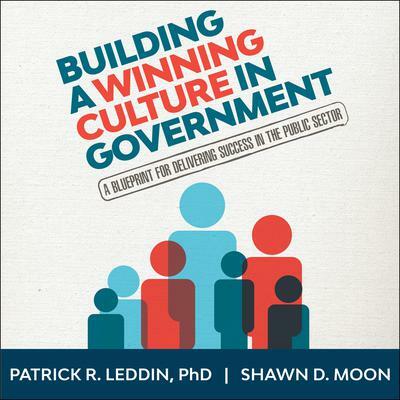 Building A Winning Culture In Government - Audiobook | Listen Instantly! Government Culture—Our government organizations face political fallout, media scrutiny, reduced funding, and the many challenges involved in motivating large, multi-layered and highly regulated organizations. It's no surprise that many government organizations report that their employees are less engaged than ever and that leaders feel helpless to change the situation. In many cases, employees and government leaders are caught in a vicious cycle. Performance declines, scrutiny increases, and employee paralysis ensues. How do you break this cycle and begin building successful government? You change the mindset from "leaders are a select few in the organization" to "everyone can and should be a leader." This simple shift is key to building successful government organizations in the 21st century. If every member of the organization is a leader, it enables government organizations to leverage the power of five highly effective and proven FranklinCovey practices that have made private sector organizations successful and are now bringing about positive change in public sector organizations. Download and start listening now! Shawn D. Moon is the author of On Your Own, a book which provides guidance and advice to young adults in the Church of Latter-Day Saints. He grew up in Utah before serving an LDS mission to Philadelphia and attending Brigham Young University, where he earned a degree in English literature. Moon currently serves the executive vice president of FranklinCovey. He lives in Lindon, Utah, with his wife and children. David Stifel trained at the Yale School of Drama and has worked for such noted film directors as Steven Spielberg and Danny Boyle.